Who can open a Vivier & Co account? Whether you’re an individual or a business, if you’re looking to maximise returns on your savings, we offer a range of online savings accounts that might be right for you. If you live outside of New Zealand and the US you can open an account today with a deposit of EUR 3,000 or equivalent currency. Our accounts give you higher than average interest rates within a timeframe of your choice, with a MasterCard debit card linked to your account that will enable you to withdraw funds wherever you are in the world. If you want to earn a competitive rate on your savings and flexibility is a priority, you can choose to open a high interest savings account on a six-month rolling notice. The interest rate is fixed for six months and when the account matures, you can either renew, withdraw your funds or renew part of your funds and withdraw the remainder. If you decide to renew, the interest rate may change in line with our latest published rate for that band of savings. If you opt to open a savings account on a 12-month rolling notice or longer and don’t give notice on the account before the maturity date, you’ll benefit from a loyalty bonus equivalent to 0.5% gross interest per annum, which is payable with your monthly or annual interest rate. However, if you make a withdrawal within three months of the initial deposit or renewal, the interest rate will be reduced by 1% as a penalty. Gross interest or interest where no tax has been deducted accrues daily and is paid quarterly on the following dates: 31 March, 30 June, 30 September and 31 December. Interest is paid to a nominated account subject to a minimum external transfer of EUR 100 or the equivalent amount in another currency. What are the account charges? How is the interest taxed? The New Zealand Revenue Department has granted Vivier & Co “Approved Issuer” status, which allows us to pay gross interest to non-residents of New Zealand, which means no tax is deducted from the interest earned. However, that said, it’s your responsibility to pay any tax due based on your individual circumstances in your country of residence. is scheduled to reach completion within two years. How does Vivier & Co provide higher than average rates? By charging slightly higher than average rates to borrowers and always keeping overheads low, we are able to pay slightly higher than average rates to our customers. In this way, we can grow deposits significantly, maintain static operational costs and predict our income with a high degree of accuracy. How does Vivier & Co protect clients’ deposits? When advancing funds, Vivier & Co always adopts a prudent loan-to-value ratio in relation to the underlying assets. These are always located in jurisdictions that have been European Union members since at least 1973. Vivier & Co does not invest in equities, derivatives or any other exotic financial products and so substantially reduces the risk from market volatility. What other security does Vivier & Co provide to depositors? In addition to the above security, Vivier & Co aims to maximise its capital reserves, aiming for above 10% of Tier I risk-weighted assets. Such a conservative level compares very favourably with the Basel ratios. Moreover, Vivier & Co maintains an insurance policy with Standard and Poor’s A+ rated insurers, providing an indemnity of over $10,000,000 on any single loss and in the aggregate. It is one of very few companies in the OECD offering a guarantee of this type. Why insurance instead of a Government guarantee? 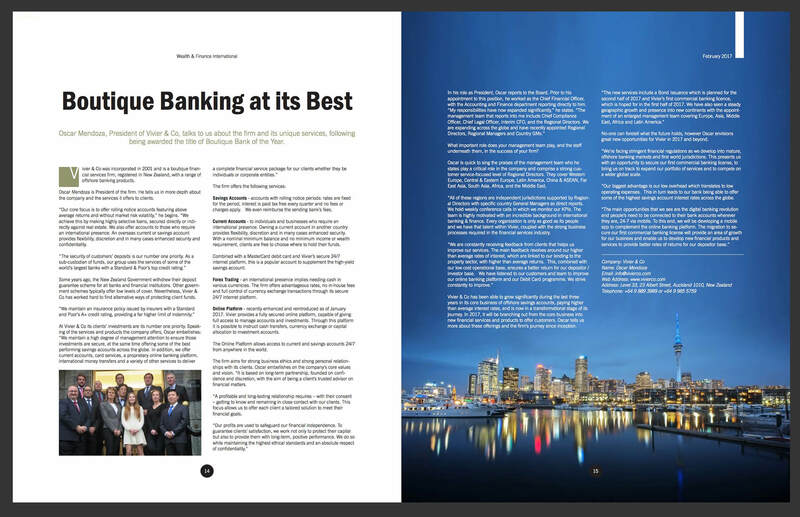 In 2011, the New Zealand government withdrew their deposit guarantee scheme for all banks and financial institutions. Although EU government schemes typically offer cover of around EUR 100,000, thousands of hard working Europeans have nevertheless lost their savings in trusted EU banks. Vivier & Co therefore found an alternative way of protecting client funds, plus a higher level of cover. We only obtained this after demonstrating our probity to the world’s top insurance companies. New Zealand is a very stable country, both politically and economically, and has a very strict system of government regulation. It is not affected by financial crises to the same extent as other countries. To pay our customers competitive rates, we’re committed to lending for longer periods and taking deposits for longer periods too. You have a completely free choice of rolling notice period, which will be reflected in the title of the account. At any time, you can write and tell us to repay you or change the current rolling notice period, which will take effect at the end of the current rolling period. For example, on 01 January, you might place a deposit on six months’ rolling notice. If you wish to withdraw funds on 30 September, you must give us notice in writing before 31 March of that year. The funds will be repaid, with interest, to any account you nominate, without deduction of taxes or charges. You can open an account with a deposit of EUR 3,000 or the equivalent in foreign currency. Is there any maximum deposit or withdrawal? For an account on notice of less than 12 months, the maximum deposit is EUR 60,000*. For an account on notice of 12 months or longer, the maximum deposit is EUR 1,200,000*. With all accounts, a maximum of EUR 300,000* may be withdrawn in any 12-month period. For these purposes, accounts held by one or more depositors, who could or do exercise their rights collectively, are considered as a single account. May I hold more than one account and/or debit card? For added convenience, you can open multiple savings and/or currency accounts, managing them all under the same name. Debit cards linked to the accounts are available to customers with EUR 10,000 or more, or the equivalent currency, across their accounts. Yes, everyone named on the account has equal access to funds regardless of who deposited the money and in accordance with the account mandate. We automatically open a free current account in each required currency for every account holder. Vivier & Co has put in place a new online platform, which is accessible here. Managing your online savings account is easy and we always try to respond quickly to your instructions via email or on the phone. Please complete and upload the various documents here . after our compliance department has checked your documents, we shall open your account and send you our account details. please then transfer your initial deposit, indicating that the costs are to be borne by Vivier. upon receipt, we shall activate your account and start paying you interest. If using the download method, please then post all the documents to Vivier & Co, Level 13, 92 Albert Street, Auckland 1010, New Zealand. Once the physical documents arrive, your account will be fully operational. Once you have transferred funds into your new account we will activate the account and start paying interest on the deposit. This means that your account will be fully operational. We will then send you an acknowledgment and an account statement to help you manage your finances. For more information about our accounts, please read our Terms and Conditions. Although documents may be translated as a courtesy to customers, the English version shall always prevail.